The adventure changes today. For the better. In his famous work, The Hero with a Thousand Faces, Joseph Campbell wrote that when stories are shortened to “bites,” all of the most profound symbolism (and therefore the deeper meanings and nourishments) are left out. And this is pretty sad, to be honest. You see, over the last four years I have been keeping a secret from you: I have been hard at work on such a story, a story that would energize, instruct, enthrall, and hopefully even nourish you. Over the past year, I have realized that, at my core, I am not a “writer” in the traditional sense as much as I am a storyteller. And because of its unique qualities, I believe this story has the potential to expand the conversation around modern myths. At least, if we’re lucky. The practical upshot of all of this is that I have indeed written an SF novel, the completion of which is the culmination of years of research, plot refinement, writing, and revision. And revision. And more revision… until I felt it was right. But perhaps even more important than its science fiction elements is the fact that it is an adventure story about loss and hope, courage and fear (and yes, even purpose), which is why as a reader of this site, I know you’ll LOVE it. 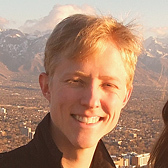 And on 12/12/12, I formally released it on the Amazon Kindle store. 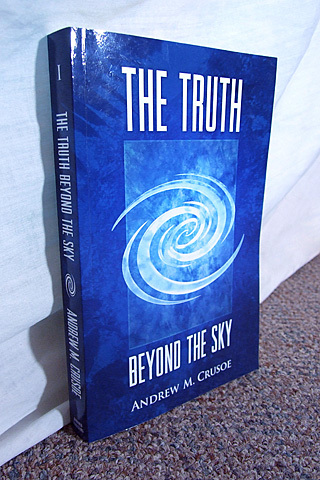 It’s called “The Truth Beyond the Sky,” and the 310-page paperback edition is pictured here. Later, I found out that a happy accident had occurred, and that its particular shade of blue seems to magically change depending on the surrounding environment. But let’s get to the gift I have for you, as a reader of this site. 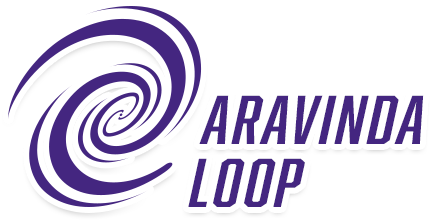 If you’ve been following along over at the Aravinda Publishing blog, you already know this, but in case not, I’ll bring you up to speed. Throughout autumn, I had wanted to write a short story to give you a free taste of this incredible world, and now that it’s out (and getting 5 star reviews on Amazon), I feel really good that I was able to create a short story that not only provides a great jumping-off point into the book, but that is being called a great story in its own right. That short story is called “The Secret Beneath the Ice,” and I’m releasing it for free over at Smashwords in ALL of the popular formats, as well as the Kindle store. I know Amazon gives you the ability to read the first 5 or so chapters of the novel, but I feel that giving you a complete story with a clear beginning, middle, and end, gives you a better feel for my storytelling style. So feel free to grab the short story over at Smashwords or the Kindle Store. UPDATE: you can now get it instantly just for signing up for my mailing list. The story within this book has been fermenting within my soul for a long time, and I’m incredibly excited to finally share it. I’ve also decided to price the ebook of the novel very aggressively at $2.99 to reach as many people as possible. So if you have a Kindle or have an Amazon account (their Cloud reader works on almost anything with a web connection) and you like SF or Adventure stories, I suspect you’ll enjoy the ride. What a great read! This has everything I could ask for in a space adventure. The story begins with a young astronomer named Zahn on the planet Avani, who lost his mother years earlier when she mysteriously disappeared. Struggling with the loss, he manages to hold out hope that she is still alive somewhere. One day, an envoy named Oonak from the Confederation of Unity crash lands on Avani and, through an act of fate, crosses paths with Zahn. Oonak asks Zahn for assistance with an urgent mission, and that launches Zahn’s grand adventure through space and time, toward the truth of what happened to his mother, and into confrontation with a terrible galactic menace. Without giving too much away, the plot only becomes more epic from that point forward. Story elements include jump gates, travel outside spacetime, explorations of alien worlds, Cthonic evil, high-tech gadgets, intelligent ships, a mythical device reminiscent of the Holy Grail, plenty of action and space battles, and some intriguing interpersonal dynamics between the four protagonists. There are some strong spiritual overtones as well. I’m not exaggerating when I say that the underlying philosophy of the book, the mythos, shares much in common with the best of metaphysical literature. Readers of the Law of One books may find familiar the philosophical thread woven throughout “The Truth Beyond the Sky.” In my view, that makes this book a rare gem in the genre. Overall, I found it an entertaining read with enjoyable characters and a colorful plot. The ending was satisfying, and turned out to only be the beginning, so I eagerly look forward to Crusoe’s upcoming sequels. Highly recommended. It feels amazing to finally be sharing this story with the world. I know that much is uncertain in these strange times, but one thing is certain: everything is going to change now. I can feel it. The Secret Beneath the Ice short story passes 2,000 downloads!